Technology Plays A Vital Role In The Way 21st Century Students Learn.Our Higher Education Solutions Create Technology-Enabled Environments That Engage Students In Extraordinary Ways While Also Supporting Innovation, Achievement And Success. 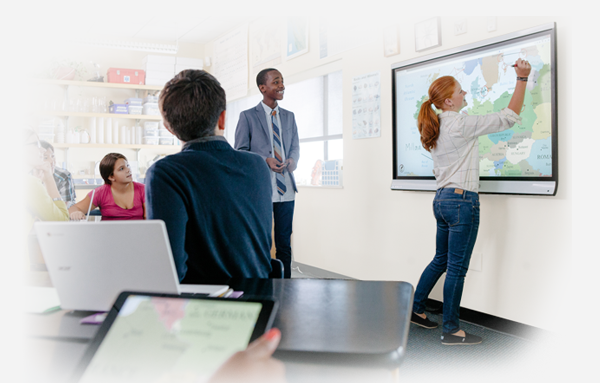 We Offer Comprehensive, Integrated Solutions That Combine Innovative Products, Resources, Professional Development And Support - Everything You Need To Successfully Implement Technology Into Your Learning Spaces And Inspire Student Achievement. As higher education and classrooms continue to evolve, both educators and students look to create interactive and collaborative classrooms which make the learning environment more efficient and effective. This can be achieved by integrating technology into a classroom. Integrating technology in education is more just a trend, but a ubiquitous means of enriching the overall learning experience for both students as well as educators. Internet access in a college classroom, give students the opportunity to learn and expand their knowledge beyond the boundaries of their textbooks. An indispensable benefit of classroom technology is that it can help create a single place for collaborating, editing information, grading and sharing assignments, thereby adding efficiency to education. Using the technology solutions by C3 IT Xperts for colleges and universities, educators can create interactive learning systems purposed to benefit academia. Make learning an engaging, visual experience for students. Deliver dynamic lectures with multimedia content and write notes in digital ink. Our interactive technologies can produce better understanding, thereby helping boost interest and productivity. Create engaging lecture presentations and dynamic collaboration sessions. You can interact with digital content and write over it on any interactive surfaces all while displaying that content on a large screen in the same room or from a remote location. Another useful thing about classroom digitization via collaborative classrooms is that students can work collaboratively on projects with others who are not in the same classroom. C3 IT Xperts helps integrate modern technology tools such as computer, interactive whiteboards, projectors, screens, etc. into classrooms, thereby helping students and educators achieve their best.